gsmith7158 wrote: Here's one I saw on ebay that I found pretty interesting so I bought it. After all how often do you get to buy a 110 year old knife in pretty good shape. The knife is stamped Friedmann & Lauterjung which was an importer in New York from 1864-1909 and is the firm where JBF Champlin got his start in the knife business. This is the firm that eventually gave rise to The Electric Cutlery Co.The seller described it as a sailors rigging knife, but it looks more like a good sized pruner to me. That's quite the knife Greg!!! 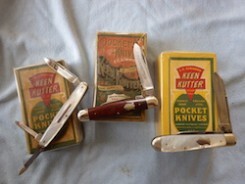 The condition and the history,my kinda knife thanks for sharing. Thanks Bill! I really enjoy finding old gems like that. It's probably a pre 1890 knife since it has no country of origin stamped on the tang. I have one of the old Electrics that they sold as well but boy they sure are hard to come by. It's pretty exciting to find one! That's a rare one Greg! Miller Bro's wrote: That's a rare one Greg! Thanks Dimitri! I nearly dropped my phone when that one popped up in my saved searches. Nice pruner Dimitri - love the handles ..
Joseph Haywood & Compy (Ca. 1845-1888) … Joseph Haywood born in 1823 in Sheffield. He apprenticed with Robert Sorby & Co Sheffield (merchant and edge tool manufacturer) and eventually took over the cutlery of his uncle, George Willis Hinchliffe, (known bowie and pocket knife maker) in 1850 following Hinchliffe’s death. Prior to 1850, Haywood was lisetd as a merchant clerk on Eyre St In addition to the trademark of "Hinchliffe", which was continued even under Joseph Haywood, Haywood was granted the “kettle” trademark in 1860 (see tang stamp of this blade). The blade was deep stamped “Joseph Haywood & Cmpy/ Sheffield Maker”. Notably the handle is pressed horn. The integral liners and bolsters suggests a manufacturing date of +/- 1860…. The company known for quality cutlery advertised pen, pocket & sportsman’s knives, pruning and budding knives existed until 1888 with approximately 165 employees reported in 1881. Unfortunately the company began to have issues following Joseph’ s death in 1888 and only existed under his son, Arthur, for only 2 more years before being declared bankrupt in 1890. The entire company was dissolved over a 12 year period and bought by Needham, Veall & Tyzack and T Turner & Sons in 1902. Turner carried on the pocket knife line and Needham, Veall & Tyzack would continue table, razor, scissors and electro-plate. Fabulous old knife and history, Lee. Nice Robeson Joe ... great condition too!! Thank you, Keith and Lee. Great old knives, Greg, Dimitri, Lee and Joe! Love that teapot tang stamp! Those don't show up too often here on the forum. It's nice to see yours. Thanks Lee for sharing your budding knife I have never seen one in person,it’s very nice . The Joseph Haywood you posted last month,really nice,love the old ones. Joe really nice Robenson you posted as well. I missed a few posts lately,thanks for sharing those.